As it is the new year, of course, the mind turns to becoming healthy again. Instead of turning to an everyday, "clean up your life" book, I instead turned to Fast Food Vindication written by a dietition Lisa Tillinger Johansan. 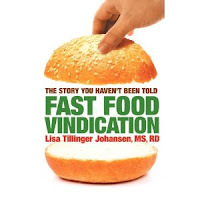 Fast food has become a favorite media whipping boy, but hospital dietitian Lisa Tillinger Johansen makes the bold case that the industry is actually a positive force in society. Relying on her nutritional expertise (and knowledge as a former fast food insider), Johansen shows how such restaurants have distinguished themselves with products that meet high standards of quality and safety. And with humor, illuminating anecdotes and fascinating research, Johansen shows the reader just how easily fast food can be incorporated into a healthy lifestyle. 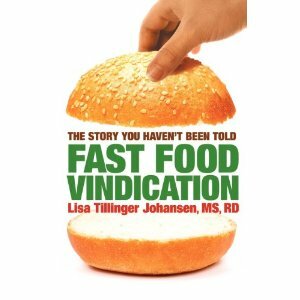 Lively and informative, FAST FOOD VINDICATION destroys the media myths and paints the true picture of an industry that touches the lives of millions. The book is a quick read and when I first picked it up wondered how a dietitian could defend the fast food industry given all the blame other dietitians and nutritionists heap on the industry. The author approaches the subject explaining that yes, fast food is bad but there is nothing wrong with going every once in awhile and staying away from the really unhealthy choices. Is it healthier to eat at a sit down restaurant? Not really. Fast food has portion control, restaurants now heap twice as much food on a plate, and much of the food has the same calories, fat and salt as fast food, yet the portion is bigger. Plus the server will always come over offering something more to eat or asking if you want a desert. Home cooking does not get off easy in this book either. People cook more and cook more unhealthy. The conclusion is that we are responsible for what we eat, not the fast food places or restaurants we frequent. We can choose healthier and eat less. I laughed at what one fast food franchisee had to say. Kids eat fast food on an average three meals a week and the fast food industry is blamed for their weight gain. What about the other 18 meals a week plus snacks they eat? I enjoyed the book and it made me think about what I eat as a whole.